Norway play Croatia, Ukraine and Switzerland on their way to a potential title defence as the way to the Women's EHF EURO 2018 was determined for 28 teams at the qualification draw in Paris on Friday. Olympic champions Russia have been drawn to Group 4 with Romania, Austria and Portugal while EHF EURO 2016 and World Championship 2015 silver medallists, Netherlands, face Hungary, Belarus and the winners of Group B in Qualification Phase 1. 15 teams will eventually qualify for the Women’s EHF EURO 2018. Hosts France are the only team that is directly qualified. The top two teams from each group as well as the best third ranked team overall will make their way to the final tournament. To determine the best third ranked team only the matches played against the teams ranked first and second will be taken into account. The final tournament takes place from 30 November to 16 December 2018. The five host cities are Nancy, Nantes, Brest, Montbéliard and Paris. Main round matches will take place in Nancy and Nantes; the final weekend will be played in Paris. Coinciding with the draw, the official mascot of the competition as well as the official website for the Women's EHF EURO 2018, www.ehf-euro.com, was launched. On www.ehf-euro.com handball fans can find all relevant information regarding the Women's EHF EURO 2018. Furthermore there is extensive coverage on the tournament’s official social media channels on Facebook (www.facebook.com/ehfeuro), Twitter (@EHFEURO) and Instagram (@EHFEURO). Following their successful appearance at the Men’s World Championship 2017, the two mascots, Rok, the bear, and Koolette, the weasel, have staged their return and embarked on a new mission: the Women’s EHF EURO 2018. The two characters embody the values of handball, combining strength and power for Rok, agility and dynamism for Koolette, their names referring to the "roucoulette", the French word for spin shot. When the World Championship had come to an end, we received many requests from fans and clubs, asking whether the mascots would continue to exist. They wanted to purchase the costumes and create communication tools with their images,” said Sylvie Pascal Lagarrigue, president the French EHF EURO 2018 Organising Committee. Presented with such enthusiasm, the OC in agreement with the EHF, decided to prolong the adventure Rok and Koolette. 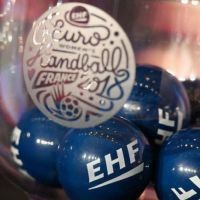 With the key visual of the Women’s EHF EURO the French Handball Federation decided to showcase the best of handball in December 2018, offering a strong promise. The key visual boasts "Handballissime", a simple tailor-made word to encourage all players towards over-achievement. Three emblematic players of the French team are featured in the key visual, representing the three generations responsible for the success of this team which not only won bronze at Sweden 2016 but also silver at the Rio 2016 Olympic Games: Laura Glauser, the rising star, Alexandra Lacrabère, a stalwart and key player of the French Team as well as speedy left back Gnonsiane Niombla. Those players stand for handball as spectacular, strong, tough and competitive sport.